The short answer I always give is that this happens every year. 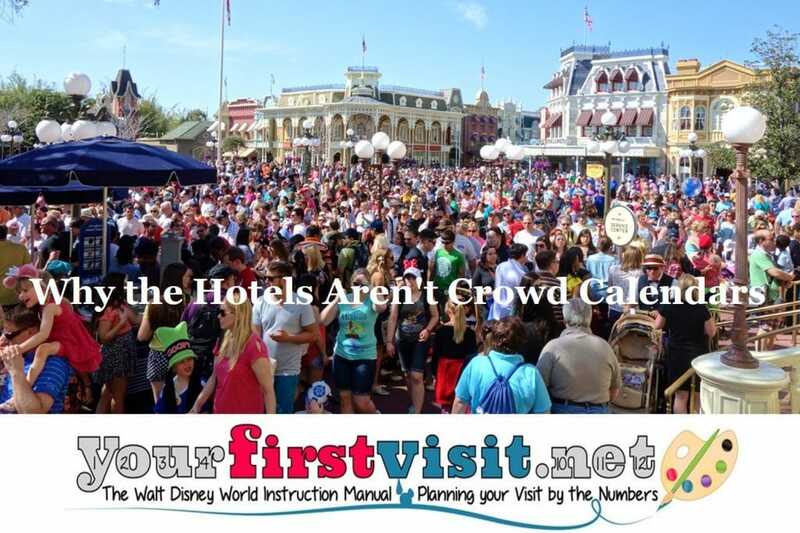 Disney World hotel occupancy is not a crowd calendar. These hotels are almost full almost all of the time, in high crowd periods or low. For three years now, occupancy has been above 85 percent, and for the last seven quarters it’s averaged 89 percent. For an average room, that equates to about two nights free every three weeks. Rooms have been even harder to find in 2017. First, about 3 percent of capacity permanently disappeared in 2017, with demolition of rooms at Caribbean Beach and Coronado Springs, and conversion of formerly eight-person areas at the Wilderness Lodge to four-person areas in Copper Creek. You can tell from Disney’s pricing patterns that the most popular nights are Fridays and Saturdays, and the least popular Mondays, Tuesdays and Wednesdays. So vacations that include weekend nights–as almost all do–are even harder to book. Moreover, I am told–I can’t independently confirm this–that Disney is booking “orphan” room nights differently. Say a room is booked through a Saturday, then available the next five nights Sunday to Thursday, and then booked again beginning the Friday after. Before this purported change, a guest who wanted to book this room Monday, Tuesday and Wednesday would have no problem, even though it would leave “orphan,” hard-to-book single nights on Sunday and Thursday. 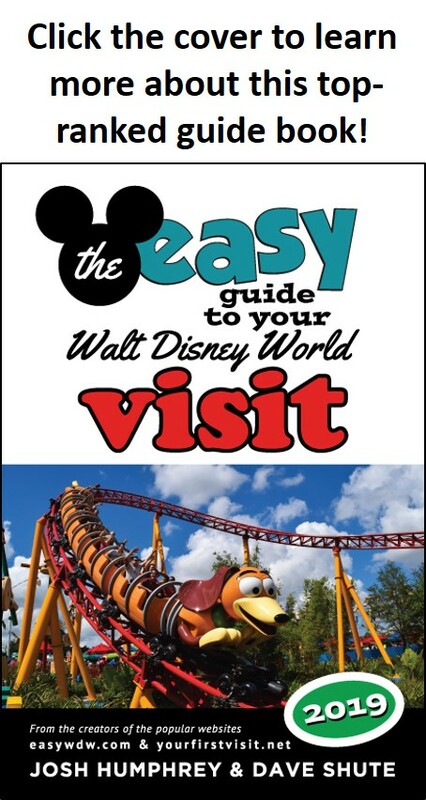 Word is that this no longer works so well, as Disney’s systems prefer in this case guests looking for a Sunday-Tuesday or Tuesday-Thursday stay, leaving a more bookable two-night block before or after. So guests looking for longer stays will run into the problem of all the weekend nights being booked up, and guests looking for shorter stays will have easier or harder times depending on how many orphan nights their preferred dates will yield. On shorter stays, shifting your check-in day just a day can help. On longer stays, dividing them into two or even three shorter stays can help. The best approach, though, is to book well in advance. Historically, people have most commonly booked their Disney World vacations three months ahead. The more ahead of this you can book your rooms, the better off you will be. More than 180 days before is the magic number…but even if it’s closer than that, as soon as possible is better than later! Another way to ease the burden is to use a travel agent, who likely will have both more patience and more ideas for finding you a room. This site has partnered for years with Kelly, who you can reach at KellyB@DestinationsInFlorida.com or 980-429-4499. The difference between 85% and 95% occupancy is about 2,540 more rooms filled per night—or, at an average of 3 people per room, about 8,000 more people. Eight thousand more people divided among four theme parks, two water parks, Universal, Sea World, Disney Springs, days off, etc. just don’t much matter to a set of theme parks that have a base average of more than 147,000 visitors a day anyway. Crowds at Disney World don’t come from the Disney hotels, which are almost always close to full. They come from hotels outside the parks. Rooms occupied by those not in a Disney theme park that day: people in a hotel room for a Disney World vacation but taking a day off from the four Disney theme parks and instead going to a water park, Disney Springs, Universal, taking a day at the pool, shopping, or skipping the parks on their arrival night)—I’ll use 25% as my assumption on this. So divide the 147,000 people in the parks on an average day by three people per room and you get 49,000 required rooms; shift this by another 25% for the folk on a Disney-oriented vacation but not in a Disney park that day and you get 65,000 required rooms. 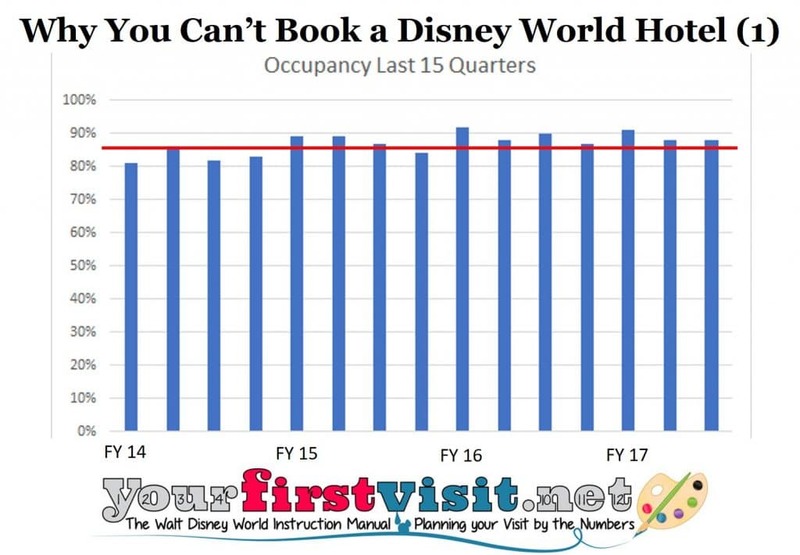 Disney World itself right now has “only” about 25,400 rooms available, and probably can’t hit much above 95% occupancy for any sustained period (at 95% occupancy rooms are booked 19 out of every 20 nights) except in the rarest of circumstances, because even with the new orphan night policy, there aren’t enough two and one-night stays to fill in the tiny gaps that exist between 95% and 100% occupancy. At 90% occupancy Disney World can serve just 22,900 of the 65,000 needed rooms—just a little more than a third. 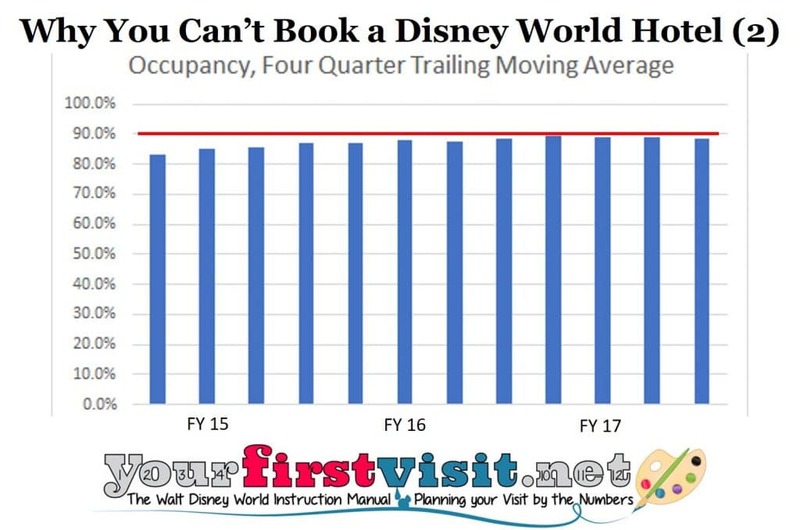 Occupancy at the Disney hotels doesn’t flex up and down much with crowds. Rather, Disney runs its price seasons and its deals to hit a fairly high level of average occupancy year round. Hotels fill up in the highest-crowd times, but they also fill up during the rest of the year too–including times when savvy Disney World visitors (the most likely to occupy a Disney space—especially DVC owners) know are great times to visit—like early December!! Want a real crowd calendar? See this. *This is Disney’s domestic occupancy, so it does include the three Anaheim hotels, which make up about 10% of total rooms. Because it’s just 10%, I ignore them, except that I do substract them to get rooms available in Florida. Absolutely fascinating information; I appreciated reading this having dealt with some hard-to-book reservations this fall. Gave me some good insight. Yes! I have been trying to make people understand for ages that the real crowds come from off-property. With “orphan nights” you gave a name to something I have definitely been sensing when trying to book or modify! Thanks for the insight. Something else I never knew but can certainly appreciate, as it definitely makes books more beautiful! Thanks! This is very useful and insightful. I am doing an early Dec trip and was trying hard to change/modify my rooms, and thought the parks were going to be jam-packed because I can’t find anything. It’s also during ‘free’ dining, so I’d bet the resorts are at 95%+ mode because of that. I can vouch for your above comment about the DVC popularity. When doing the initial plannig for this, I did look at one of the DVC resellers for availablility around my dates, and it quickly went from \’limited\’ to \’no, stop asking\’ availability. Thanks again!